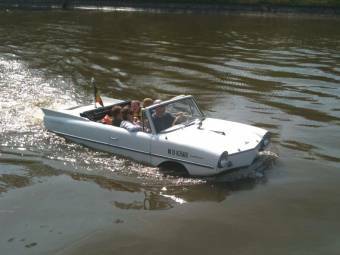 The German-designed Amphicar is an amphibious car that can be used on land or on water. It was first produced in 1961 and 3,878 were sold before production ceased in 1968. Today, the vehicles are collector’s items. 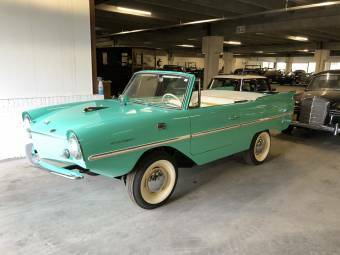 The Amphicar is the only amphibious vehicle to be mass-produced. It was designed by Hans Trippel, a German ex-racing driver who also designed for Mercedes-Benz and Troll. 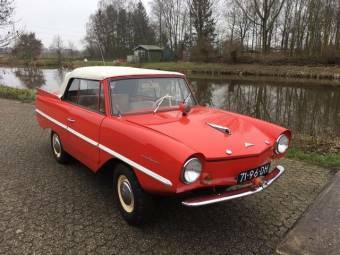 The Amphicar was built by Harald Quandt, a German industrialist who inherited holdings in several auto companies, including BMW and Daimler-Benz. 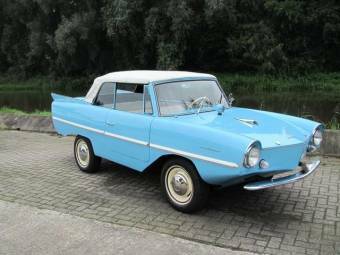 The Amphicar was manufactured at his Karlsruhe Augsburg AG (IWKA) industrial plants in Berlin and Lubeck. Quandt died in a plane crash in 1967, which contributed to the end of the Amphicar’s production a year later. 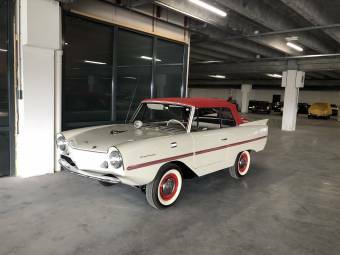 The Amphicar was a two-door cabriolet convertible that was powered by a Triumph 43hp four-cylinder engine, as used in the Triumph Herald 1200 car. Twin propellers made of nylon were mounted beneath the rear bumper. The Amphicar had a top speed of 7 knots when used as a boat and 70 mph on land, giving it the alternative name Model 770. The car had a rear engine with front-wheel steering, with the front wheels acting as rudders when it was used in water. 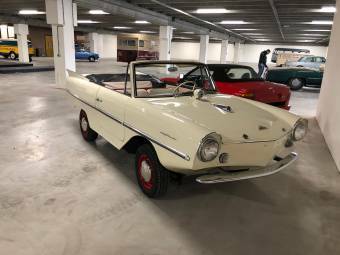 The Amphicar had a special four speed transmission, designed by Hermes, which allowed simultaneous or independent operation of wheels and propellers and also allowed the car to reverse when in the water. Customers had a choice of four colours: white, red, blue or green, with a body that was made from mild, plain-carbon steel. The electrical system is a Lucas 12 volt positive ground system. Despite its limited production in the 1960s, the Amphicar gained a high profile and appeared in many films and TV shows. President Lyndon B Johnson was a famous fan and loved to tease guests at his ranch by pretending his Amphicar was a normal car and letting it run into a lake, only revealing its amphibious qualities at the last moment. Some of the cars were used by the police department of Berlin and the Amphicar was used in many publicity stunts, including crossing the English Channel and the Yukon River. 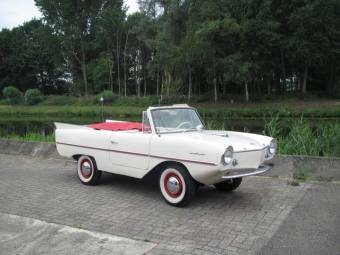 The main market for the Amphicar was the USA, where they sold for between $2,800 and $3,300. Around 90% of Amphicars, 3,046, were exported from Germany to the United States. The car’s major market was removed, however, when EPA and DOT regulations that restricted car imports came into effect in the USA in 1968. 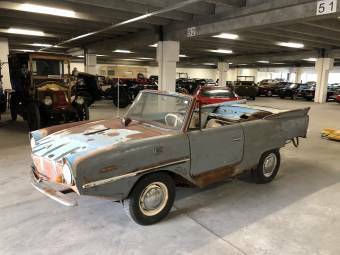 Today, preserved and restored Amphicars are highly valued by collectors, many of which attend regular Amphicar ‘swim-ins’. The PlayStation game, Gran Turismo 4, featured an Amphicar in 2004.